Today the Church celebrates St. John Climacus, or St. John of the Ladder. St. John is best known as the author of "The Ladder of Divine Ascent," a monastic ascetical treatise that is both widely celebrated and oft-misunderstood. 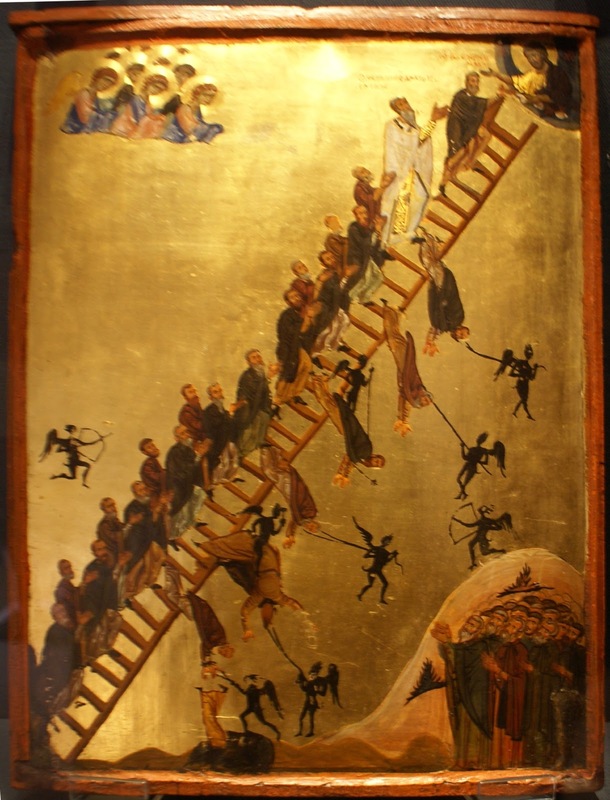 The most notable point about the Ladder to me, depicted in the icon at left, is the demons dragging the faithful off of the ladder. And the most notable part of that is that it doesn't appear to matter where one is on the ladder -- the demons constantly attack, and there is no rung where one is "safe." It is interesting to me because it refutes the common misconception that asceticism somehow merits or earns salvation (or, more common, that those of us who practice it think it does). Rather, asceticism is what salvation is meant to be in practice, but the only thing it earns or merits is a struggle with the demonic. Anyone who has suffered significant spiritual setbacks after a period of asceticism such as Great Lent can attest to this. Therefore, as we struggle with the fast, St. John pray for us.